Hey all! Just thought I'd do a quick post on my latest Pinterest recipe find. Now that spring is here, everyone I'm sure are whipping out their grills. Well, here is a great little marinade for chicken you plan to barbecue. Simple and easy-to find ingredients! I threw mine over rice-and-peas with a small salad on the side. Our grill ran out of gas mid-grilling, so I finished mine up in the oven--hence it not being as charred as I would like. 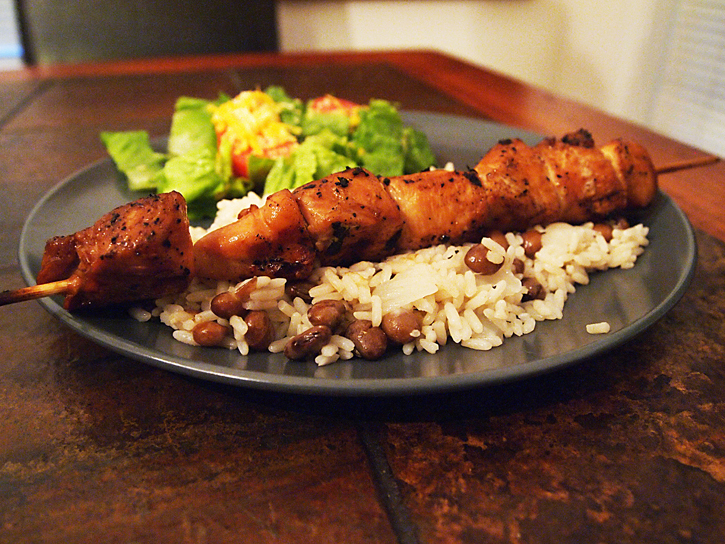 Oh, and don't feel like you HAVE to make kabobs--but I suggest you do as you get the flavor of the marinade in every bite-sized piece! I have your food sensibility - simple to make and good. Thanks for posting. Looks delish. Seems you've been cooking a lot lately which is always appreciated by the hubs.